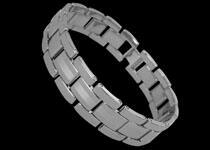 Tungsten carbide is the latest cutting-edge metal to reach the jewelry market. Our tungsten jewelry have a brilliant high polish or a fabulous brush finish. These pieces of jewelry will come anywhere from a high polish to brushed to a black ice coloring. The most common color to describe a high polished tungsten jewelry is Gun Metal. It's a beautiful deep grey silver. 2. With the superior nickel-binder alloy, free cobalt. 3. Ultra highly polished finish. hold its shape and shine longer than other ring. 4. Virtually un-scratchable:18xs harder than gold,4xs harder than titanium,5xs harder than tool steel. Tungsten Carbide Jewelry are made to last a lifetime. 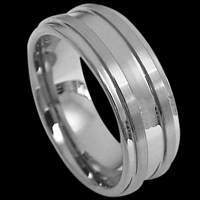 Our Tungsten bands are a natural choice for men who want a resilient metal that shows little signs of wear. They are very masculine because of the tough and enduring qualities of this unique metal. Tungsten is a heavy metal yet also hypoallergenic. Our bands are virtually scratchproof, and make the perfect gifts for graduation, Father's Day, Valentines Day, Groomsman gift or for a Wedding Band for that special occasion you wish to commemorate.